Planned for this trip for about a week now. Got off of work at 4 hopped in clay's truck and headed to the key's got there around 8ish p.m. I had a big baracuda in the freezer i took with me down there. Right when we got there the current was going the right way so we quickly rigged up the shark rod's and deployed bait's. I ran out a 9/0 senator with a back half of a cuda. (since my recently my big shark reel duel12/0w got stolen...) Not even within 5 minutes the reel is screaming i did my hookset and it was on took me down to quarter spool having to angle the fish to keep her between the power lines was the tricky part. After about a 30 minute fight we get her straight up and down and seen it was a big bull so we snapped a few pics and let her go. Up next is Lane's 130 VSX to go off. We are sitting down with a half of a big jack out and all of a sudden we hear a pop then the big 130 starts rolling fast we lay into her and it's on pulling really good drag and surging back and forth between the power line's. Fight was on for a good 30 minutes or so until we got her straight up and down another huge bull shark. Tide end's up flipping and everyone put's the baits out the other way and hopes for some more big bulls are around. What do u know we hear a 130 slow rolling down the bridge we go over lay into the fish. It's on.... we thought it was a big big big shark in the current ended up being a big 8'4" bull we walked this one down the bridge to get some good pictures. Clay got the last one of the night. Check Out The Shark Fishing Series Of Articles Here On Bullbuster.net! Proper Hook Placement For Landbased Shark Fishing - This article talks about (and shows you with pictures) how to hook your baits in order to get more hookups. (This article talks mostly about J-Hooks we prefer if you use circle hooks, we will be putting up an article on that soon. The 5 Best Landbased Shark Fishing Baits- Ever wonder what the best baits for landbased shark fishing are? Here are a few that will get the job done everytime. How To Get Started In The Landbased Shark Fishing World- This article gives you some rules of thumb to conserve the sport for years to come, some communities to join, and some people to talk to if you are just starting out with landbased shark fishing. 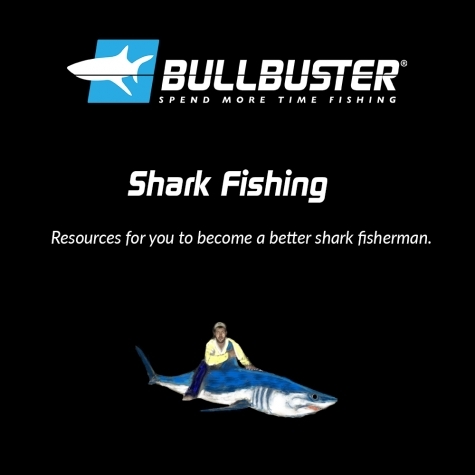 Shark Fishing In Our Roots- This article talks about some of the original Bullbuster team members and how they got into shark fishing, as well as how shark fishing evolved for them over the years. Shark Fishing (A Look Back In The Logs) - This article written by Bullbusters founder talks about the history of landbased shark fishing, specifically the South Florida Shark Club, and how the right to sharkfish is often tested and must be protected. It also is why as a member of the sport you must remember that you are an ambassador for all shark fishermen, and when you do something at your beach it affects many other anglers in the sport.